The multivariate variance analysis,cluster analysis and principal component analysis (PCA) were conducted based on 18 morphological characters that including 8 numerical characters and 10 metric characters in amphioxus populations from Qinhuangdao (QHD),Qingdao (QD) and Xiamen (XM) with 25 samples,respectively. The results showed that significant difference (P<0.05) in means of 18 morphological characters such as length of body,height of body,number of dorsal/ventral septa etc.,existed among 3 different amphioxus populations,and there were great variance among populations than within population. Multiple comparisons of the LSD of morphological characters of 3 amphioxus populations showed that QHD and QD populations existed significant difference (P<0.05) in 14 morphological characters,expected in number of buccal cirri,number of dorsal septa,number of ventral septa and number of total myotomes. 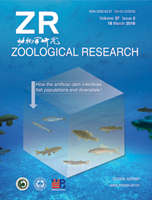 QD and XM populations were no significant difference (P>0.05) in 7 morphological characters such as length of body,height of body,number of myotomes in middle,number of gonads,height of rostral fin,height of dorsal fin and height of supra-caudal fin. QHD and XM populations were similar (P>0.05) in 5 morphological characters,e.g. height of ventral fin,length and height of supra-caudal fin,length and height of sub-caudal fin. In the results of cluster analysis suggested that all of the 75 samples were divided into two clusters clearly. Cluster II were mainly maded of 21 samples from XM population, while QHD samples and QD samples were pooled into cluster I. The result of the first three principal components from PCA showed that there were about 3 groups gathered by the all samples,QHD,QD and XM groups. All samples from XM population were pooled into one independent group;QHD and QD groups were pooled with some individual swarmed and crossed each other showed from the graph of PCA. It is inferred that XM geographical population had been great genetic differentiation in morphological characters,and amphioxus populations from QHD and QD also had genetic divergence on the whole while similar in some morphological characters.